67 calories each. Makes 36 mini muffins. Baking spray – 60 calorie allowance for oiling – omit if you use paper patty pans. Preheat oven to 180 degrees on fan forced setting. Sparingly spray non-stick muffin baking tins or lay out paper pans. Chop walnuts and place in bowl with flours, baking powder, and brown sugar. Mash banana with a fork and add oil, egg whites and rice milk. Mix roughly. Add wet ingredients to dry and mix until combined. Add a little water if you need the mixture to be a bit sticky. Spoon generously into 3 x 12 hole mini-muffin trays and press down a little to ensure they are not too crumbly when cooked and fall apart. Bake in moderate oven for 20-25 minutes or until lightly browned . Cool on a wire rack. These muffin are moist and heavy but not hard. They are crumbly in texture and very mouth watering. 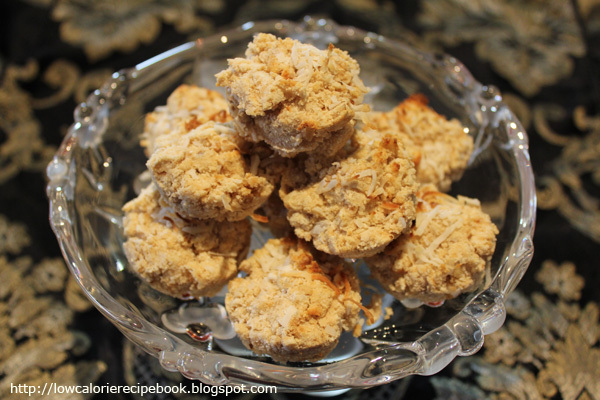 If you love coconut you will adore this recipe. These are also quite filling for a small snack. The coconut dominates the banana but you still enjoy the banana flavor.